Joy comes from what we know, not how we feel. That’s what we’ve come to know when we were diagnosed with a life-changing chronic illness. Not just one of us; but both of us. This is something we’ve only shared with close family and friends. Until now. Why Are We Sharing About Chronic Illness? A few months ago, God began to stir a spirit of boldness in our hearts to step out in faith and publicly share our journey with chronic illness. You see, when we say that learning to live within the priorities of God not only changed our marriage, it changed our life; we meant that literally! Up until now, we’ve only shared SOME of our testimony. 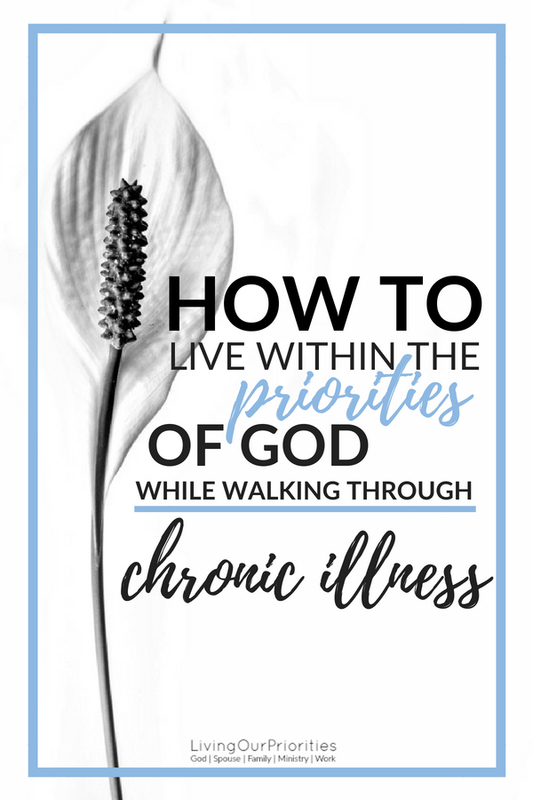 However, a huge part of our testimony is living within the priorities of God while walking through a chronic illness. We realized there are many people who suffer with chronic illness. And our hope is that by being transparent about our journey, it will help encourage others. If you read our about page, you would know that when our Pastors (who were our mentors) went home to be with the Lord, we were asked to serve as co-pastors in our church. It was only because we have embraced a lifestyle of living within the priorities of God, that we found peace in saying “yes” to God. As we knew that we would not allow our marriage or our family to be neglected while serving in ministry. What you don’t know, is that at the same time of our pastors going home to be with the Lord, we were both diagnosed with a chronic illness. A month before our beloved mentor, Ed went home to be with the Lord, Timberley was diagnosed with Rheumatoid Arthritis. A few years later Ed’s wife Lorri went home to be with the Lord, in which a month before she passed, Andre was diagnosed with Parkinson Disease. You can only imagine how extremely difficult the loss was for us both emotionally and spiritually. Only now it was so much more than that. We were physically weak in our bodies and didn’t know what our life would look like going forward. By this time, we were intentional about living within the priorites of God. As it became the barometer for every decision we made regarding our marriage, our family and our commitments in ministry, even our finances. Now we were faced with embracing God priorities through chronic illness. And there were many questions going through our minds. How was this going to look in regards to our marriage? Would this affect our family? Would we be able to still serve in ministry? How would this affect us at work? Should we step back from everything and focus on our health? It seemed odd that God would ask us to step out of the boat into the deep water while being physically challenged. We felt alone, and was at a complete lost with what to do. Many times we asked ourselves; why was this happening? More importantly, why was this happening to us? At the same time, our hearts were grieving and God was asking us to do something bigger than ourselves. Could we have said “no” to God and focused on our health? Yes! And it would have been justified. However, because we practiced making God our priority, even before each other, we knew our future was in the hands of our God. We were going to have to approach walking through this physical challenge the same way we have walked through every area of our life. And that is within the priorities of God. We knew that part of living within God’s priorities was going to include prioritizing our health; so that we can do all that God calls us to do. Therefore, we only had two choices. We could either; wallow in self-pity, focusing on how horrible we felt; thinking about how different our lives would be. Or, we could walk through this diagnosis while prioritizing God, as we wait for the complete manifestation of healing. Having a chronic illness such as Rheumatoid Arthritis, Fibromyalgia, or Parkinson’s disease can change one’s life overnight. What was once normal becomes impossible some days. But once we sought God’s truth over the medical facts, we decided there were three ways we were going to walk through this journey. The Bible tells us that death and life are in the power of the tongue. So we were not going to give life to these diagnoses. What we mean by that, is that we don’t say “I have Parkinson’s.” Or, I have Rheumatoid Arthritis. Instead, we would say; I’ve been diagnosed with Parkinson’s. The medical facts may be what they are, but the truth is, God is the great physician and has the final say. And since the words we speak will give death or life to a situation, we decided that our words will line up with God’s word. Our physical bodies may feel weak at times, but God has truly become the air we breathe. We experienced this first hand when getting out of bed became a challenge. The strength to get out of bed, came when we meditated on God’s Word until our body lined up with His word. Therefore, we knew early on that we could not start our day without spending time with our Heavenly Father, through prayer, worship and reading His word. When your body is talking to you (through pain), you have to learn how to talk back to it with the word of God. By meditating on God’s word, we found; words of healing, and the promises we have in this life, and the life to come! Some days we may only be strong enough to listen to worship. The bottom line is, we cannot walk this journey in peace without first walking close to God. Through this journey we’ve realized that prioritizing our health falls right in line with prioritizing God. Our bodies are the temple or the house in which the Holy Spirit lives. As a result, we must take ownership for caring for our bodies. If we don’t prioritize our time with God and time to tend to our physical body, then our physical body will not be strong enough to tend to each other. Neither will we be strong for our families, serve in ministry or even earn a living. Do you see how the priorities of God affects every area of our life? It has only been through this journey, that we’ve learned the importance of caring for our temples by maintaining a healthy diet, getting enough rest and regular exercise. Most people don’t know that we’re walking through a health challenge unless we tell them. And that’s the testimony. Our testimony doesn’t come after we are completely healed. No! Our testimony begins with how we walk through life as believers in Christ. That’s because the Bible doesn’t promise us a life without trials and tribulations. On the contrary, the Bible tells us to count it all joy when we have trials and tribulations of any kind. Which means, our joy comes from what we know (the Bible) not how we feel. Therefore, while we wait for complete healing, we will look and act like what we know (JOY) not how we feel. Living within the priorities of God is not just about keeping our priorities in order. It’s about maintaining our priorities for; our spirit, soul and body! In order for us to have strong bodies to do all the things God has called us to, we need to rely on God as our helper, as much as He is our healer. If you’re growing weary while walking through a chronic illness, we want to encourage you to continue walking close with God. God has a purpose for your life, and He did not bring you this far, too only bring you this far. We have chosen to not allow a diagnosis to define us, but propel us closer to God. And we look forward to sharing with you what God has given us, that allows us to live a full life while waiting for the complete manifestation of healing. PS…If you want to continue following our health journey be sure to subscribe to our newsletter by filling out the form below. This post is being shared on Salt and Light Link Up. Jewel you have always been our number one supporter. Thank you for your prayers and encouragement to keeping going. Love You! Fantastic encouragement. We have been in ministry for years and this article truly blessed us because my husband was diagnosed with AML (Leukemia). A rare, aggressive (and according to medical science), incurable bone marrow cancer😞. We are believing God for a miracle healing!! Hi Annie! Thank you for sharing with us, and it blesses us to know that what we shared encouraged you. That was our prayer for starting the conversation with what we have been walking through. Pastor’s I am sooo glad that I took the opportunity to read this blog. I admire and love the two of you so much. Reading this, and knowing what you and the family has been walking through, brings tears to my eyes, again. It’s been one of the blessings in my life to know you, and serve with you! Love you ❤️ And the Gray family! Thank you Papa Ron! We love you too and we are grateful to serve alongside of you as well. Thank you for sharing your story and your beautiful heart. I know Jesus will continue to provide healing, peace and joy as you serve him . I’m right there with you. Cancer is a part of my story, but it’s not my whole story. Thank you for your encouragement! I’m so glad to have “found” you (I bet you didn’t even know you were missing, right?)! Actually, you were and I found your post on Salt & Light. I HAD fibromyalgia, but God healed me. Now I have been diagnosed with Major Depressive Disorder and osteoarthritis. Thus far, I’ve had one hip replaced and a revision to replace the femur when it shattered as a result of the hip surgery. I’ve had a total knee replacement and am looking at a revision on that in a couple of weeks. I’ve had three bladder cancer surgeries and four non-cancer bladder surgeries. But I have Christ as my Light and I have learned some important lessons about moving forward in pain. I’ve subscribed to your blog because I want to get to know you better! Such a great post! I am so glad I read this today. I am encouraged!! Both my husband and I are journeying through injuries right now…my husband’s more long term even chronic to mine. I like what you said..we are not our diagnosis. We need to live this truth every day. Making God our priority is of great importance. I’m so grateful you chose to share with us. Blessings always!